Now in its 9th school year, our filmmaking club is our longest-running program. The program teaches students about filmmaking and the environment, and then assists them in making a short films ranging from documentaries to music videos. In our first 8 years we have served youth ages 12-18 from 16 different Maui schools! Your donations help keep our programs affordable for all students. Over 100 films on YouTube! Our YouTube channel now has over 100 student films with over 60,000 views! They empower the voices of Maui’s youth to educate our community and visitors about how they can help protect our island’s environment. The 60 short environmental films produced by our filmmaking program have been selected 116 times in 23 film festivals around the world! These films include documentaries, claymation films and even music videos. For spring of 2019 we are offering a condensed version of our popular filmmaking club open to grades 7-12 from all schools. Students will work in teams of 3-4 students to make a short environmental film on a topic of their choice. 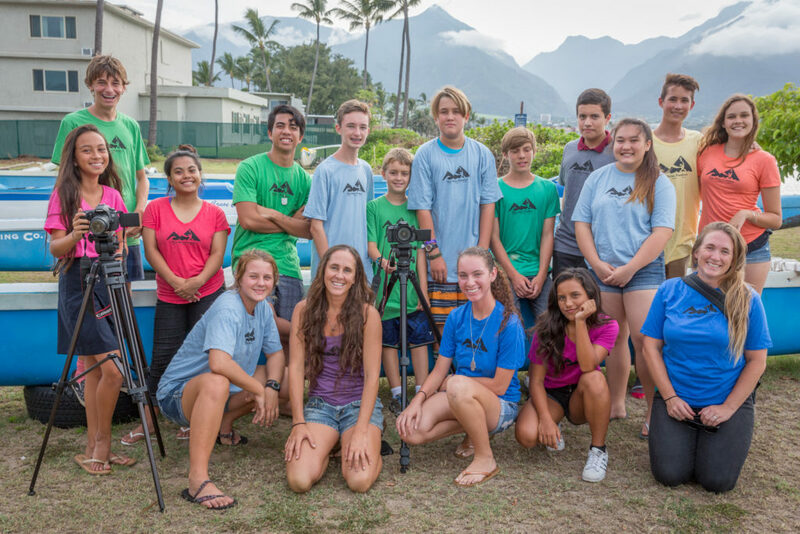 The films will be shown at our annual Huliau Youth Environmental Film Festival at ʻĪao Theater in Wailuku in May and then entered in film festivals around the world. Films range from documentaries, to claymations, to music videos, and have been selected at film festivals over 100 times. The program will meet at Hawaiian Canoe Club in Kahului. The program fee is $75 and includes snacks and equipment. Need-based scholarships are available and easy to apply for. Schedule details: The first two days are from 9am-4pm on Sunday March 3rd and Sunday March 10th. Those sessions will focus on learning to use the equipment, filming practice activities and discussing potential film topics. All students will meet again during spring break on Monday March 18th 9am-4pm to finalize their film topics and filming plan. From March 19th- 22nd, each team will schedule 2-3 filming sessions lasting from 4-6 hours. The exact times and hours will depend on their film topic and be agreed upon by each team. Editing will be finished on a flexible schedule by students anytime before April 22nd. Students can expect to schedule 2-3 sessions after school or on weekends, depending on the length of their film. We will work with students to find a few meeting times that do not conflict with other activities. To sign up use the application button below. For questions email info@mauihuliaufoundation.org or call Malia at (808)757-2100. Apply for our Spring Program! The HEFC program is a semester-long club open to students ages 12-18 from all Maui schools. Our program is now in its 9th school year and serves 12-16 students per semester. The program meets after school and on weekends at the Hawaiian Canoe Club in Kahului. Students work in film teams of 3-4 students. Each film team will also schedule off-site filming sessions throughout the island. Maui Huliau Foundation staff assist students in investigating environmental or conservation- related issues affecting their community. The students conduct research, plan a storyline, film in different locations around the island, and turn what they learn into short film. 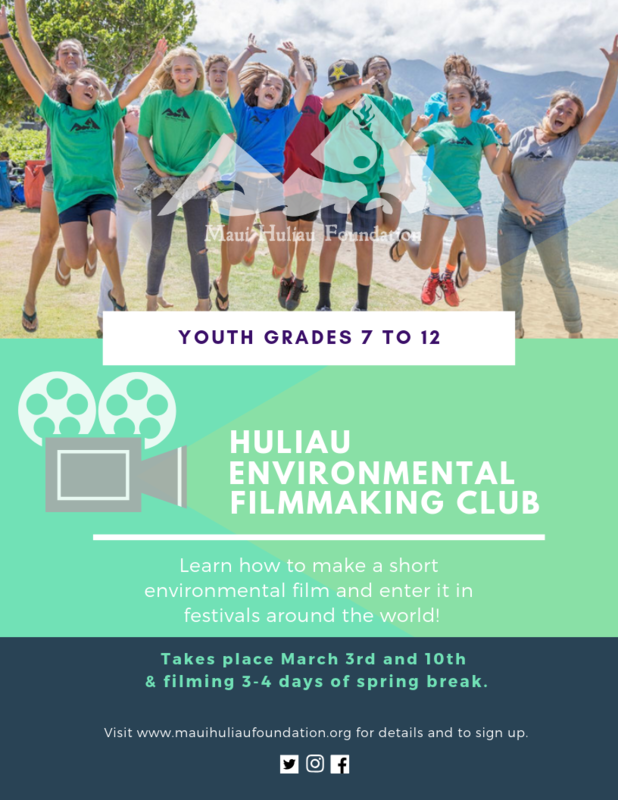 At the end of the school year, students will help plan our annual Huliau Youth Environmental Film Festival, where their films will be shown. After the festival, we also help students enter their films in different national film festivals. You can see the 100+ short environmental films our students have produced on our YouTube channel. Many of these films have been selected at film festivals around the world! 1. Fill out an application on-line above. 2. You will receive a confirmation email when your application is reviewed. 3. A Maui Huliau Foundation representative will contact you to let you know that registration for the program is beginning. They will assist you in filing out the proper registration forms and waivers. They will also help you determine if you should enroll in the MEO transportation program, and if so, assist you with enrollment. Program fee is $75 which includes snacks, a Huliau T-shirt, equipment use and most off-site filming transportation. Need-based scholarships are available. To apply for assistance, simply check that option on your application form and we will get back to you with further instructions. Meeting times vary by semester. Please see above for details. Making a film requires dedication and flexibility. During the first weeks, you may also have weekly “homework” assignment (usually taking about an hour) to work on pre-production of your film. You must be on-island and available to film for at least part of fall or spring break. We have a strict attendance policy, especially for the first sessions, and missing a sessions may result in your removal from the program. Maui Huliau Foundation has partnered with the Hawaiian Canoe Club to host the HEFC program at their classroom in Kahului. Mahalo to the Hawaiian Canoe Club for providing a home for our HEFC program! Hawaiian Canoe Club is located in Hoaloha Park on the water along Kahului harbor between First Hawaiian Bank and Maui Seaside Hotel. To get there you turn off the ocean side of Ka’ahumanu Ave where the Akamai Motors lot is (across from Kahului Shopping Center) and go past it to the public parking area. Our classroom is up the stairs on the Wailuku side of the blue building. For a Google map link click here. For regular after school sessions, MEO youth transportation drops students at the Hawaiian canoe club between 2:45 & 3:30pm and picks them up at 5:30pm. Students who arrive by 3:30pm with their own transportation and can stay until at least 5:15pm are also welcome to participate. Contact us if you have any questions. Students can also use the Maui Bus and walk across to the Hawaiian Canoe Club from Ka’ahumanu Shopping Center.